Do you welcome dogs on your restaurant’s patio? What about a customer who wants their animal right there at the table? It’s not an uncommon experience. Patrons have been inviting their furry friends to join them for public meals for years. But is this actually the law? Who can bring a dog in a restaurant and who can’t? Why are the rules different? Restaurants and customers struggle with the laws that surround this issue. Health and safety are the main priorities for both restaurant owners and patrons. For instance, New Mexico statutes have been enacted to expand the presence of pets in outdoor dining areas, giving them similar access as that afforded to service animals yet dogs that are not service animals are restricted from being inside a restaurant. Pets, emotional support animals and service animals have very different regulations. These are important to distinguish, especially if you plan on bringing your pooch to your next meal. To understand the statutes regarding animals in outdoor or indoor dining areas, you must first be able to identify how a service animal differs from a pet or emotional support animal. Service animals are defined as dogs (and, in rare cases, miniature horses) that are individually trained to do work or perform tasks for people with disabilities. Examples of such work or tasks include guiding people who are blind, alerting people who are deaf, pulling a wheelchair, alerting and protecting a person who is having a seizure, reminding a person with mental illness to take prescribed medications, calming a person with Post Traumatic Stress Disorder (PTSD) during an anxiety attack, or performing other duties. Service animals are working animals, not pets. The work or task a dog has been trained to provide must be directly related to the person’s disability. Emotional Support Animals, including dogs and other animals whose sole function is to provide comfort or emotional support do not qualify as service animals under the ADA. Simply having a vest on does NOT make an animal a service animal. How does the ADA and Federal Law affect Service Animals? When considering these laws and protections, don’t forget that the ADA applies to Service Animals, not Emotional Support Animals or Pets. Leashing: Under the ADA, service animals must be harnessed, leashed, or tethered, unless these devices interfere with the service animal’s work or the individual’s disability prevents using these devices. In that case, the individual must maintain control of the animal through voice, signal, or other effective controls. Accompanying the customer: Under the ADA, State and local governments, businesses, and nonprofit organizations that serve the public generally must allow service animals to accompany people with disabilities in all areas of the facility where the public is normally allowed to go. The ADA ensures that all governing bodies at a state and local level as well as businesses and nonprofits, must allow service animals access to normal public spaces. When it comes to a restaurant, this means a service animal can join their owner in a restaurant. This ensures that the owner stays in control. Asking the customer about their animal: When it is not obvious what service an animal provides, only limited inquiries are allowed. Staff may ask two questions: (1) is the dog a service animal required because of a disability, and (2) what work or task has the dog been trained to perform. Staff cannot ask about the person’s disability, require medical documentation, require a special identification card or training documentation for the dog, or ask that the dog demonstrate its ability to perform the work or task. Liability: Service animals rarely stray from their duties. However, if they do, the business or public space is not liable. Owners are still responsible for damage their service animals may cause and must provide food and necessary arrangements for their service animal. Once you know the definition of a service animal, it becomes pretty clear how they differ from a normal house pet or emotional support animal. While a pet’s company is often preferred, it is not necessary for the owner to to perform their daily activities. Every facility must abide by this federal law. 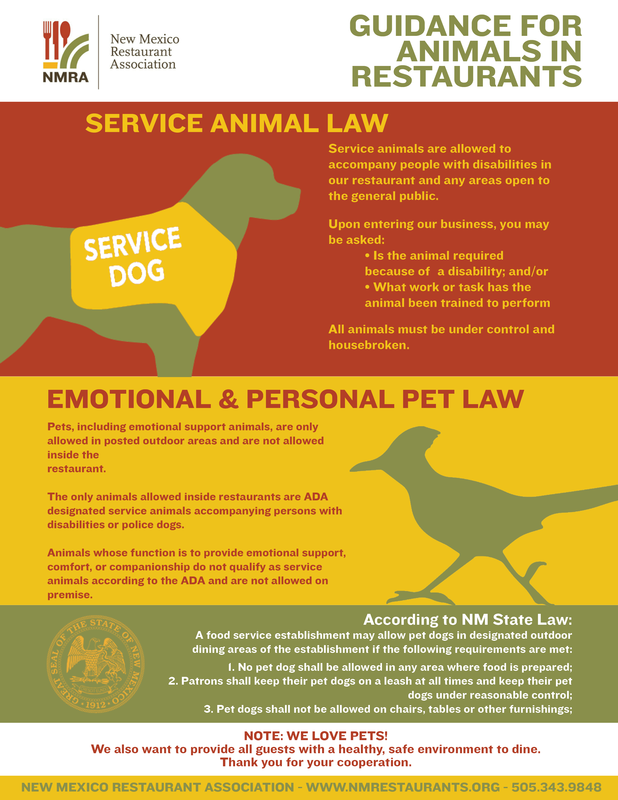 What are NM Statutes on Pets in New Mexico Restaurants? New Mexico has two controlling rules, one environmental health department rule for dogs in restaurants and another for dogs on patios. 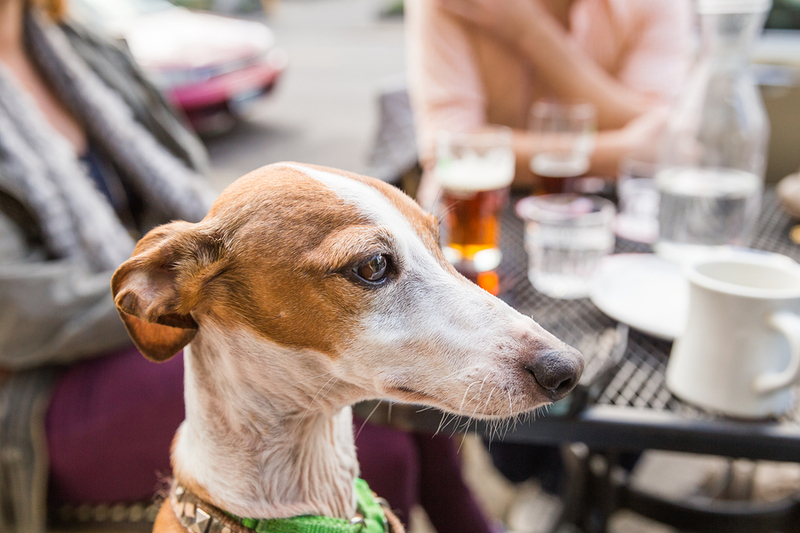 Whether you accept dogs on your outdoor patio is at YOUR discretion. You are not required to accept pets on your patio. You do, however, need to accept dogs that meet the service animal guidelines under the ADA. You are only required to accept service animals indoors. Emotional support animals are not allowed by law in a restaurant. Emotional support animals do not have the same protections as service animals. Even though airlines and some other industries are now allowing emotional support animals on board flights, the sanitation regulations in restaurants don’t allow pets inside restaurants. Restaurants wanting to expand their clientele to include pet dogs must also apply for a permit and are allowed to refuse service to dogs and owners not abiding by their rules. No pet is allowed anywhere food is prepared, including inside the restaurant. All pets must be kept on a leash and under reasonable control. Pets are not allowed on any furnishings, including tables and chairs. Restaurants must post proper signage containing language to inform the public that pet dogs are allowed on the premises. The signage must adhere to size and placement restrictions. Employees must immediately clean up accidents involving pet waste and sanitize the area. Pet dogs in outdoor dining areas; requirements. (4) a sign or signs shall be posted to place the public on notice that the designated outdoor dining area is available for the use of patrons with pet dogs. Signs shall be at a minimum eight and one-half inches by eleven inches in size and use type that is uniform in size and no smaller than necessary to fill the sign to within two inches of the borders. The signs shall contain language reasonably designed to inform the public that dogs are permitted and may be present. Signs shall be posted prominently and be easily visible in both the area where dogs are permitted and at the entrance of the establishment. The board shall promulgate by rule the specific language to be included in the signs pursuant to Section 74-1-9NMSA 1978.